Goldenhead is a girl from an earth-like (male/female) world who never felt at home there. She lived most of her life with an “imaginary” pixie companion, frequently visiting the “imaginary” city-sized spacecraft called the Imperial Princess. While Goldenhead is trying desperately to “grow up” and leave her “fantasies” behind, her body falls into a coma and she finds herself fully among the people and places she believed she had imagined. 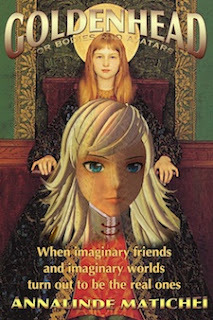 She also finds her new real world threatened by dark, demonic forces and becomes one of the three Little Knights determined to protect the Motherland. The author plays a prominent role in the small press that published this book. Add your review of "Goldenhead: Or Bodies Or Avatars" in comments!